Learning how to install a basement bathroom can be tough. It’s a huge puzzle. And any wrong step can lead to massive problems. In addition, there are plenty of online tutorials that share costly ‘short cuts’. So today we’re sharing tons of great tips for building a new basement bathroom. How to Install a Basement Bathroom…What’s First? Basement bathrooms sometimes require additional plumbing. Know the local building codes and what you’ll need to comply. This Old House has a fantastic tutorial that shares plumbing tips for basement bathrooms. Once the plumbing is done the next step is to assess the bathroom floor. Basement bathrooms are notorious for uneven floors. Use a four foot level to see if the floor needs to be self-leveled. We use Laticrete NXT or Ardex Liquid Backer Board for this step. Always prime the floor with the product that’s made by the company who produces the self-leveler. This way, the bond will be good and not fail. 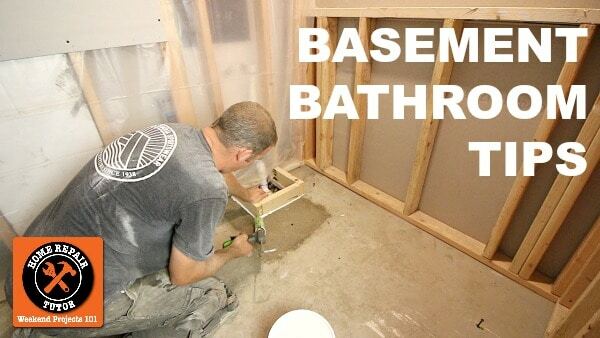 Our tutorial shares all the steps necessary for leveling a basement bathroom. Allow the leveler to set up per the directions, and the next day install your tub or shower. Acrylic tubs often require mortar underneath. Always use mortar if the directions call for it. This prevents acrylic tubs from flexing and breaking. Our detailed tutorial shares all the steps necessary to install a basement tub. This can be tricky due to the plumbing connections. But we’ll walk you through it. Also, most shower systems can be installed directly over concrete. For example, KBRS’s Tile-Basin or ShowerSlope are great options. In addition, Schluter’s Shower System and Wedi’s Fundo Primo can be used as well. Curbless showers are tricky in basement bathrooms but possible. Our detailed course shows all the steps needed for this kind of project. Modern materials make waterproofing showers so much easier these days. Hydro Ban Board is one of our favorite new options. Boards are light, easy to cut, and very affordable. Wedi’s backer boards are similar but a bit more expensive. And Schluter’s KERDI-BOARDs are another foam board we like. Cement board is the cheapest alternative, but use either RedGard, Hydro Ban, or Ardex 8+9 to waterproof. Basements get moisture from concrete floors. So it’s imperative to waterproof. Hydro Ban, ShowerSeal, RedGard, and DITRA or DITRA-HEAT are all great options. Liquid waterproofing membranes like Hydro Ban, ShowerSeal, and RedGard are applied using a paint roller. Most of the time it’s necessary to do two coats. This involves waiting and depends on the temperature and humidity. DITRA or DITRA-HEAT can be set, waterproofed, and tiled over in one day. Which makes them a great option if you’re short on time. Knowing all the different steps for building basement bathrooms is helpful. But putting them together can be a challenge. 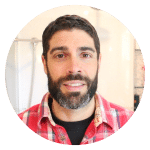 If you want more detailed tips for building basement bathrooms get our new course over on Bathroom Repair Tutor. The plumbing part is daunting in itself so we haven’t begun the work yet. However, this tutorial is thorough and the video looks very helpful. I only wish I could work the project as fast as the video completes it! Thanks a lot!